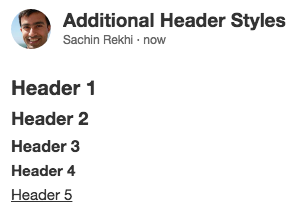 Today we're adding additional header styles up to H5. While these new headers aren't shown in the styling bar, you can easily add them via keyboard shortcuts (Cmd+3, Cmd+4, Cmd+5) or via markdown syntax (###, ####, #####). You'll find these listed in the keyboard shortcuts dialog in case you forget.